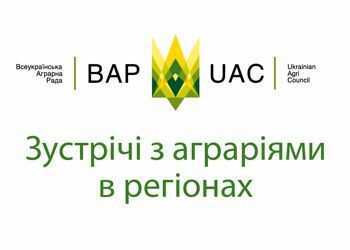 UAC, together with international organizations and bilateral cooperation projects, developed and introduced in the Verkhovna Rada a new edition of the Law of Ukraine "On Agricultural Cooperatives". The new edition provides for the creation of opportunities for the emergence in Ukraine of modern cooperatives capable of successfully competing with private traders. UAC specialists managed to convince V.Ivchenko, Deputy Chairman of the Agrarian Committee of the VRU (the author of an alternative bill), about the main provisions of this draft law. The agrarian committee of the Verkhovna Rada considered the bill and recommended it for adoption in the first reading. The given draft law introduces an effective model of the economic activity of the agricultural cooperative, which allows it to increase its competitiveness in the agrarian market, prevents double taxation (at the level of the cooperative, and at the level of its members), makes it possible to act both for the purpose of profit and to save for itself non-profit status. The draft Law of Ukraine "On Agricultural Cooperatives" is developed to systematically and comprehensively regulate all legal relations regarding the establishment, operation and termination of agricultural cooperatives, taking into account international standards and best international practices. The main principle of the draft law "On Agricultural Cooperatives" is the rejection of the strict division of agricultural cooperatives by types of production and service, giving the members (founders) of the agricultural cooperative a choice of activities: production, service, processing or multifunctional, as well as the form of activity — for the purpose or without the purpose of profit. Accordingly, it is proposed to move to a single organizational and legal form - an agricultural cooperative. At the same time, the draft law provides for the gradual transition of existing agricultural cooperatives to a new uniform form. At the same time, the draft law, unlike the current regulation of the relevant relations, eliminates unjustified restrictions and offers additional opportunities for the development of agricultural cooperatives. In particular, agricultural cooperatives acting for the purpose of profit (regardless of the type of activity selected) will be entitled to carry out transactions with persons who are not members or associate members of such cooperatives, provided that the aggregate value of such services and transactions does not exceed 20 per cent of the proceeds cooperative, and they will not have any restrictions on the transfer of ownership of the products of their members. The draft law also provides for the creation and operation of agricultural cooperative associations - so-called second-tier co-operatives, which are widespread in the world. At the same time, the right for agricultural cooperatives (agricultural cooperative associations) to establish cooperative associations and to be members of cooperative associations formed in accordance with the Law of Ukraine "On Cooperation" is retained. Thus, the legislative settlement proposed by the bill on the one hand allows preserving all existing conditions for agricultural cooperatives and producers of agricultural products, which, despite the imperfections of the current legislation, plan to continue / start operating in such conditions, on the other - it offers for producers of agricultural products new opportunities for the development of agricultural co-operation. Adoption of the bill will stimulate the development of existing and the formation of new agricultural cooperatives, increase their market share in the production and marketing of agricultural products. This will increase the competitiveness of small and medium-sized producers in particular, and the social development of rural areas in general.